Past perfect tense definition: The past perfect tense is a verb tense used to express actions that occurred in the past that finished before another action in the past started. The past perfect one of the four verb forms of the past tense. It is used for actions that started and finished in the past before another action started. That other action also occurred in the past. Because the past perfect is a part of the “perfect” tense, it expresses completed actions. That is, the action that started in the past is finished, or complete. The past perfect tense is used to express a few different things. After we had purchased tickets, we were able to enter the venue. I had attended the event for years without ever having to purchase tickets. If had purchased tickets, we would have been able to enter the venue. The official asked if we had purchased tickets. We wished we had purchased tickets. Let’s look at some additional past perfect tense example to fully understand its many uses. I had never flown in an airplane before I went to London. After she had attended college, she became a police officer. They had forgotten the answer until the teacher reminded them. These examples indicate that the action began and ended in the past. Furthermore, they began and ended BEFORE a second event occurred. That second event is also in the past. He had admitted his fault to her repeatedly. They would have never known the truth without investigating. These examples indicate that the action began and ended in the past. Additional, the event also lasted for a period of time (duration) but has now ended. If I had listened during class, I would have passed the test. If you had understood me, you would not be asking questions. If we had called ahead, we would not have waited. These examples indicate a conditional action that occurred in the past. The conditional action is a prerequisite to the consequence of the condition. The boss had said it would be a long day. The child had wondered how many stars were in the sky. The student had asked another question. These examples indicate speech that occurred in the past. Each of these actions is finished, or complete. It is possible that they occurred more than once or over a period of time. I wished I had returned the item. He wished he had ordered a different meal. We wished we had brought our dog on vacation. These examples indicate an event that did not happen actually happen. The speaker shows dissatisfaction with his decision (not stated in the sentence) and states the action he wishes had occurred. There are two other primary perfect tenses: the present perfect and the future perfect. I have lived in Brazil. They have listened to reggae since college. When we leave, the sun will have set. We will have worked together for eight years in September. Define past perfect tense: the definition of past perfect tense is the tense denoting that an action was completed before another specified past time or past action. 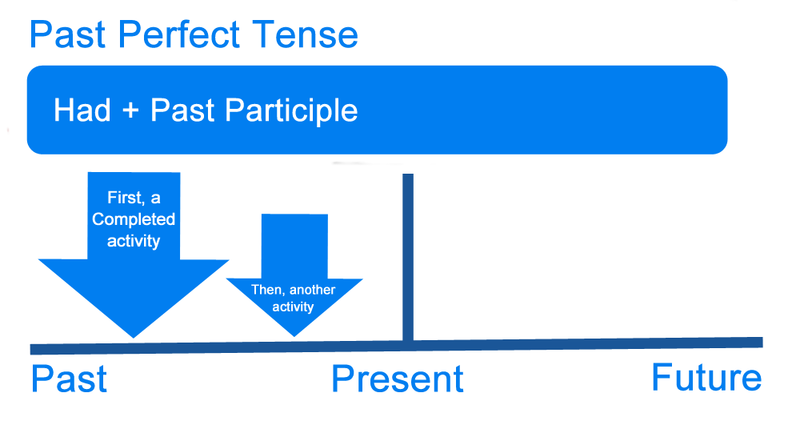 1 What is the Past Perfect Tense?